The Nobel prize for chemistry has gone to a single researcher for his discovery of the structure of quasicrystals. The new structural form was previously thought to be impossible and provoked controversy. Daniel Shechtman, from Technion - Israel Institute of Technology in Haifa, will receive the entire 10m Swedish krona (£940,000) prize. The Nobel prize in chemistry caps this year's science awards. Professor David Phillips, president of the Royal Society of Chemistry, called quasicrystals "quite beautiful". He added: "Quasicrystals are a fascinating aspect of chemical and material science - crystals that break all the rules of being a crystal at all." Dr Shechtman had to fight a fierce battle against established science to convince others of what he had first seen in his lab at the National Institute of Standards and Technology in Washington - formerly called the National Bureau of Standards - on an April morning in 1982. For years, the researcher was "ridiculed" and "treated badly" by his peers, he recounts. The Nobel laureate first created quasicrystals by rapidly cooling molten metals, such as aluminium and manganese, by squirting the mixture onto a cool surface. By sending an electron wave through a molten metal "grate", the Israeli researcher was able to see how the wave was diffracted by the metals' atoms. Under the microscope he observed that the new crystal was made up of perfectly ordered, but never repeating, units - a structure that is at odds with all other crystals that are regular and precisely repeating. 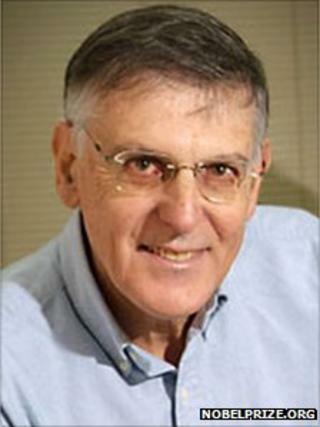 Dr Shechtman himself is said to have cried "Eyn chaya kazo", which translates from the Hebrew as "there can be no such creature". "The head of my lab came to me smiling sheepishly, and put a book on my desk and said: 'Danny, why don't you read this and see that it is impossible what you are saying,'" Dr Shechtman recounted in an interview with Technion. The Israeli researcher was later told that he was a disgrace to the group and asked to leave. On returning to Israel, Dr Shechtman published the results. "Then all hell broke loose," he said. Many scientists from around the world started telling him that they too had seen the same crystal structure. Not everyone was convinced, however. To his dying day, Linus Pauling, the head of the American Chemical Society, said that Dr Shechtman was "talking nonsense". But Bassam Shakhashiri, president-elect of the American Chemical Society, told BBC News: "This is how we make progress in science. "[If] someone comes up with a discovery that we are sceptical about…we [have to] take time to verify the observations and discuss the conclusions among ourselves." He added: "This is a really great example of the triumph of science. "And an opportunity for all of us... who are curious about nature, to be vigilant, to be careful, and to engage in respectful debate about the interpretation of results." Irregular shapes, similar to what Dr Shechtman was seeing, are found in the medieval Islamic mosaics of the Alhambra Palace in Spain. The tiles that line the walls and floors of the palace are regular, and follow mathematical rules, but also never repeat themselves. Following Dr Shechtman's discovery, scientists have formed other kinds of quasicrystals in the lab, and a naturally forming example has been found among mineral samples from a Russian river. Quasicrystal structures tend to be hard, non-sticky and are poor conductors of heat and electricity. These properties make them useful as coatings for frying pans and as insulating material for electrical wires. They are also found in the world's most durable steel, used in razor blades and ultra-fine needles in eye surgery. "It's a great work of discovery, with potential applications that range from light-emitting diodes to improved diesel engines," said the president of the American Chemical Society, Nancy Jackson. Dr Andrew Goodwin, from the department of chemistry at Oxford University, added: "Shechtman's quasicrystals are now widely used to improve the mechanical properties of engineering materials and are the basis of an entirely new branch of structural science. "If there is one particular lesson we are taking from his research, it is not to underestimate the imagination of nature herself." The Nobel prizes have been given out annually since 1901, covering the fields of medicine, physics, chemistry, literature and peace. Monday's award of the 2011 prize for physiology or medicine went to Bruce Beutler of the US, Jules Hoffmann from France and Ralph Steinman from Canada for their work on immunology. And Tuesday's award for physics went to Saul Perlmutter and Adam Riess of the US and Brian Schmidt of Australia, who will divide the prize for their discovery that our Universe's expansion is accelerating.